Stems: Woody vines, trailing or climbing to 45 feet or more by means of tendrils, glabrous or pubescent; stems of mature plants several inches in diameter; young branches green to dull reddish brown. Leaves: Alternate, simple, thin, heart- to egg-shaped, 3 to 6 inches long, about as wide, some deeply 3-7-lobed, lobes tapering-pointed, mostly glabrous, shiny green above, green with pubescence along veins below; margins coarsely toothed. Inflorescences: Panicles, compact, pyramidal, 1.5 to 5 inches long, opposite leaves. Flowers: Inconspicuous, greenish, fragrant; calyces short; petals 5, attached together at tips, separate from one another at bases; stamens 5. Fruits: Berries, spherical, 1/4 to 1/2 inch in diameter, waxy, purplish black, appearing from July-September; seeds 2-4, about 1/5 inch long, rounded to short beak, reddish brown. Habitat: Low woodlands, thickets, rocky stream banks, fencerows, and open hillsides. Uses: Native Americans ate the berries fresh and dried them for winter use. Wildlife will consume the fruits. 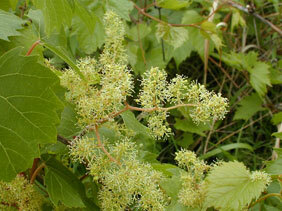 Comments: Some plants have perfect flowers, which form grapes, and some only male flowers, which provide pollen.